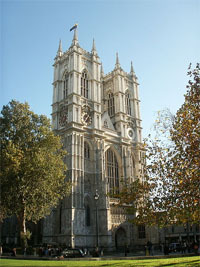 Westminster Abbey, a UNESCO World Heritage site is one of, if not the most important commemorative site in Britain. The sheer symbolic value of the Abbey is extrodinary and potentially unmatched throughout the world. Every sovereign (with the exception of Edward V and Edward VIII) has been crowned here since William the Conqueror in 1066 and most of the monachs from Henry III (died 1272) to George II (died 1760) were also buried there. Insiders Tip Avoid the crowds, turn up very early or very late. There's loads to see but it can become a little crowded. Tickets: Prices range from free for children to £10 for Adults. 9:30am - 3:45pm Mon-Fri, to 6:00pm Wed, to 1:45pm Sat, last entry 1 hr before close. Checkout the Westminster Abbey website for more details. The Abbey has played host to 16 royal weddings since 1100. Most recently Londoners have had the privilege of witnessing the royal wedding of Prince William and Kate Middleton (who could forget that dress) but for more than five centuries between 1382 and 1919 there were none at all. Highlights of this London attraction include a statue of the Virgin Mary holding a baby Jesus, the Nave with the grave of the unknown warrior and the Little Cloister leading the College Gardens. Inside, there a various monuments to those who have been laid to rest, in addition to the unknown commemorating the WW1 there is also the likes of Winston Churchill, Charles Darwin and Isacc Newton to name a few. If there is one church/cathedral in London that you are going to visit, this truely is the one.